TS Ed.CET-2019 Certificates Verification Dates(Schedule) for Web Counselling/Exercise Web Options for Two year B.Ed Course Admissions: A Common Entrance Test, designated as TS Education Common Entrance Test-2019 (TS Ed.CET-2019) will be conducted every year by the CONVENER, ST Ed.CET-2019, Osmania University, Hyderabad on behalf of the Telangana State Council of Higher Education for admission in to B.Ed (Two years) Regular Course in the Colleges of Education in TS State for the academic year 2019-2019. The qualified candidates of TS Ed.CET-2019 Examination are informed to attend the final phase certificate verification for exercising online web options for admission into two years B.Ed. course for the academic year 2019-2020, as per G.O. MS. No 24, dated: 24/08/2017, on the dates mentioned against their state-wide rank and methodology, in any one of theHelpline Centers (HLCs) with all original certificates as detailed below. 2 Warangal Directorate of Admissions Kakatiya University Campus, Vidyaranyapuri, Warangal. TS EdCET 2019 Web counseling:The Telangana State Council of Higher Education (TSCHE) will start the certificate verification and web options for Common Entrance Test for BEd courses. The counselling will end on .... Candidates can exercise web options from .... The aspirants can check details at the official website – edcetadm.tsche.ac.in. The test was conducted for five subjects including mathematics, physical science, biological science, social studies and English. Make sure to carry print out of all certificates. Processing fee for SC/ST candidates is Rs 300 and for others Rs 600. The Osmania University, Hyderabad conducts the entrance exam on behalf of the Telangana State Council of Higher Education (TSCHE) to select candidates for admission to BEd (2 years) regular course in the Colleges of Education in Telangana for the academic year 2019-2020. 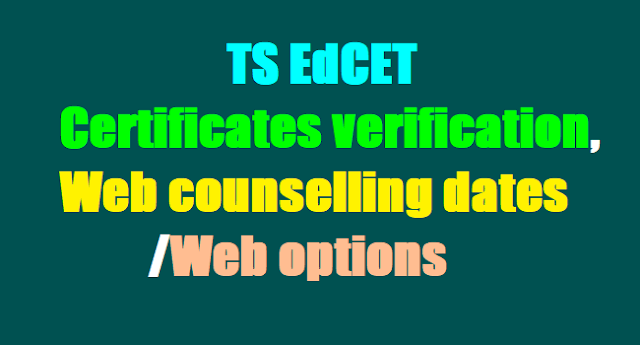 TS EdCET 2019 counselling 2019 web options at edcetadm.tsche.ac.in: The Telangana State Council of Higher Education (TSCHE) has acivated the link for students to exercise their web options. Candidates who have applied for counselling process for through the state common entrance test for BEd courses (TS EdCET 2019), can fill in their choices for colleges and medical seats today. The web option dates for the first round will be open and students who have secured ranks in TS EdCET 2019. Candidates who wish to apply for mathematics and biological science courses and have secured ranks for maths and biological sciences are required to report for certificate verification. The web options for all subjects and all ranks will carry on he certificate verification and will be closed. Step 1: Go to the official website for the exam (edcetadm.tsche.ac.in). Step 2: Click on the link for “Web options”. Step 4: Select your options and submit the details. Step 5: Save a copy of your selected options for further reference. The candidates who attend the certificate verification can enter their choice web optionsas per schedule. Theseat allotmentwould be made after completion of web options process.The qualified candidates of TS EdCET-2019 Examination to be informed to attend the certificate verification for exercising web options for admission into two years B.Ed. course for the academic year 2019-19 on the dates mentioned againsttheir state-wide rank and methodology, in any one of the Helpline Centers (HLCs) (See Annexure-I) with all original certificates as detailed below. The qualified candidates of TS Ed.CET-2019 Examination are informed to attend the certificate verification for exercising online web options for admission into two years B.Ed. course for the academic year 2019-18, as per G.O. MS. No 24, dated: 24/08/2019, on the dates mentioned against their state-wide rank and methodology, in any one of the Helpline Centers (HLCs) (See Annexure-I) with all original certificates as detailed below. • Residence certificate of either of parents in Telangana for 10 years in case of non-local candidates excluding the period of employment outside the state. This certificate should be obtained from the Tahsildar. • Caste certificate issued by Competent Authority (in case of SC/ST/BC). • PH/CAP/NCC/Sports/Minority certificate (mentioned in Graduation/Post Graduation TC) certificates wherever applicable. Examination shall be verified at the Help Line Centers at the time of Certificate Verification. Therefore it is mandatory for the candidate to attend for Certificate Verification.  The candidates who have not given the Biometric details at the time of TS Ed.CET-2019 Examination (list placed in the website: http://edcetadm.tsche.ac.in, http://edcet.tsche.ac.in) shall have to Register the biometric details duly furnishing an undertaking mentioning the reasons for not giving the Biometric details at the time of TS Ed.CET-2019 Examination at any of the Help Line Center as per the schedule. 1. Adilabad Govt. Degree College for Men, Adilabad. 5. Karimnagar SRR Govt. Degree College, Karimnagar. 6. Khammam SR & BGNR Govt. College, Khammam. 7. Mahabubnagar Palamuru University, Mahaboobnagar. 8. Medak Government Polytechnic College for Women, Medak. 9. Medak (Siddipet) Government Polytechnic, Rajagopalpet, Siddipet. 10. Nalgonda Nagarjuna Govt. Degree College, Nalgonda. 11. Nizamabad Giriraj Degree College, Nizamabad. 12. Warangal Directorate of Admissions Kakatiya University Campus, Vidyaranyapuri, Warangal. TS EdCET 2019 Certificates verification to be started from July 9 for 2 year B.Ed Course admissions in Telangana State. Eligible candidates were applied their applications through Online mode for this stream from below given dates . Applied Ed.CET 2019 Candidates were appeared the entrance exam, which was held on 16-07-2019. TS EdCET 2019 results were released by OU officials and EdCET Candidates checked their results from the official web portal tsedcet.org. The Qualified Candidates of TSEd.CET-2019 for admission into B.Ed Course in Telangana are informed that the certificate verification in Helpline Centers will commence in the month of July, 2019. For detailed notification list of Helpline centers, detailed procedure of Web based counselling, admission procedures and list of Colleges and more details are available on TSEd.CET Portal. The certificate verification process for the Telangana State Education Common Entrance Test (TSEd.SET) for admission into two year BEd courses would commence in July, 2019. About 13 helpline centers across the State were arranged for the certificate verification process. 1. Candidate has to get the certificates verified at Help Line Center before he/she can start exercising options. 2. One Time Pass word(OTP) would be sent to registered mobile number. 4. Allotments will be made in the order of preference of options and exercise utmost care while entering options. 5. Candidate can download the provisional allotment order and report to the concerned college. Candidates are required to be present on the notified date and time at the helpline center with all the relevant certificates and fee. Candidates are called for registration rank-wise. The candidates are required to sign in the register and pay the processing fee and proceed for verification of certificates. Candidates belonging to SC / ST category have to pay Rs. 300/- and all others have to pay Rs.600/- towards processing fee which is non-refundable. The candidates belonging to BC/SC/ST Categories are required to submit integrated Community certificate duly signed by Mandal Revenue Officer [MRO]. Tuition fee reimbursement will be as per the rules of state government of Telangana. Income certificate issued by MRO after 01-04-2019 will only be considered. The students of Andhra Pradesh have to pay the full fee. The candidates shall produce Original certificates as notified at the time of certificate verification and bring Xerox copies of certificates for submission. The verification officer will verify the genuinity of the certificates produced and collect the Xerox copies of certificates. After verification, the candidate shall collect the Receipt of Certificates from the counter. Candidates need to verify the mobile number, caste category, local area, gender, minority, parental income, and special category, date of birth, eligible degree, specialization and details of TS Ed.CET examination printed on receipt of certificates. Any discrepancy should be brought to the notice of Camp Officer / Coordinator immediately for corrections. Seat allotment process depends on the accuracy of the above data. You are also jointly responsible for ensuring the correctness of the data. Candidate can give options on the web either from helpline centre / home / any other place having internet facility. To exercise web-options candidates has to login with Hall-ticket number and Rank. A five digit PIN will be sent to the registered mobile number. Don’t share the PIN with other. On the notified date, the web options are processed and allotment is communicated to the candidate through SMS. Candidate can download the provisional allotment order, and report at the concerned college. For exercising options, the list of all eligible colleges is displayed on the website. Candidates are instructed to be careful while exercising options on the web and take the print out of the Saved options. Refer Procedure to Exercise Web Options, for exercising options on web. Candidates are informed to check their final allotment, take printout of allotment letter from the web, and report to the respective colleges, on or before the date furnished on the allotment letter, failing which the candidate will forfeit the admission. If a candidate wishes to withdraw from counseling, he / she can do so by submitting an application to that effect to the coordinator, help line center along with receipt of certificates. Processing Fee once paid will not be refunded. Next round of counseling for left over seats in phase-l and not reported cases and new seats sanctioned, if any, will be conducted subjected to requirement and decision of TSCHE. If a decision is taken to conduct second phase counseling a separate notificati on will be placed in the website for Phase-II, for the left over seats and new seats, if any, sanctioned. Who should participate in Phase-ll ? If the candidate secures a seat in phase - II, he / she will loose the claim on the earlier allotted college, and has to report to the new college by downloading the allotment letter on or before the date furnished in the allotment letter. Failing to report within the date furnished in the allotted college, the candidate will forfeit the claim on the new college as well as on the old college. If the candidate is not interested to join in allotted college, he / she may request for cancellation of allotted seat at the helpline center before the date specified. Before a cut off date the candidate can cancel the allotted seat, by getting endorsement on request letter from the Principal of the college. After the cut-off date for admission in case the candidates wish to cancel their admission, they are required to approach the Principal of the college concerned only. Candidates can give web options from helpline center or internet cafe or house as per the schedule given in the notification. a) Candidates should have secured 50% marks either to the Bachelors Degree i.e. B.A./B.Sc./B.Sc. (Home Science)/B.Ccm./B.C.A./B.B.M or the Masters Degree in relevant subject or any other qualification equivalent there to. Candidates should have secured minimum 55% marks in B.E/B.Tech with science, mathematics as one of the subject or any other qualification equivalent there to, are eligible for Mathematics and Physical Sciences methodology. However the candidates belonging to all other reserved categories i.e. S.C., ST., B.C., A.B.C.D.E & physically handicapped should have secured 40% marks in the qualifying examination. 1- Mathematics Candidates with B.A. B.Sc./B.E / B.Tech., with Mathematics as one of the subjects or B.C.A. candidates with Mathematics at Intermediate level as group subject. 2- Physical Sciences Candidates with B.Sc/B.E/B.Tech, who have studied Physics and Chemistry or allied material sciences as one of the subjects or B.C.A. candidates with Physical Sciences (Physics and Chemistry) at intermediate level as a group subject. 3-Biological Sciences Candidates with B.Sc/B.Sc. (Home Science) who have studied Botany and Zoology or allied Life Sciences under Part- II group subjects or B.C.A candidates with Biological Sciences at intermediate level as group subjects. 4- Social Studies All candidates with B.A/B.Com/B.B.M/ BBA or B.C.A candidates with Social Sciences at intermediate level as a group subject. The candidate should report to the principal of the college allotted as per the dates mentioned in the allotment letter. when is the seat allotment ? The Process is going on wait for Few days..
Pls provide link to correction on web option..